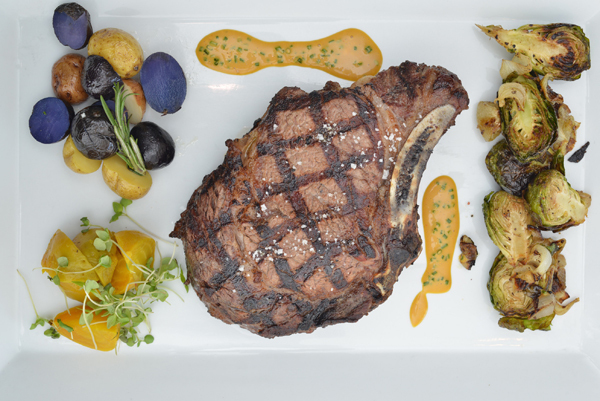 Every season brings back the flavors and ingredients we've missed year-round, so it's always pleasant to see when restaurants rotate with the months. Fig & Olive at Fashion Island in Newport Beach is one of those places that highlights the colors and tastes of each season and has done so this fall with some autumnal inspirations. Executive Chef Pascal Lorange debuted the new menu items on October 7th but will continue to feature these beauties in the coming months, showcasing the flair of the French Riviera in his dishes and transforming some staples into more seasonally appropriate revisions. You better believe pumpkin is involved! I was invited in to taste some of the delights they have this season, and there was no disappointment here. To begin the evening, I indulged in a low glass of their Fig & Walnut Julep ($14 - bourbon, St. Germain, port, muddled black mission figs, mint, and fresh citrus garnished with shaved walnuts) which took advantage of the bourbon's weight and paired it with slightly sweet port. The muddled black mission figs left some "pop" from the seeds in the sips, and the shaved walnuts lent a unique texture atop the drink. Beware though - the shavings can become mushy if not consumed quickly. Overall, a balanced drink with strength and smoothness in the bourbon but brightened by the use of fruit, citrus, and the exposure of mint. 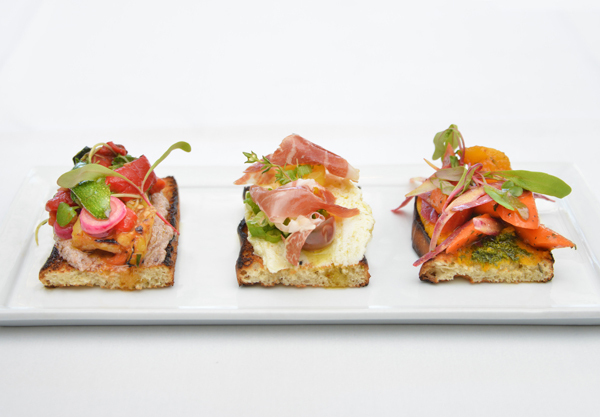 The dish that was revamped on the menu for the fall season was the assortment of Crostini that Fig & Olive offers. Our options were their Grilled Vegetables (with Ricotta olive tapenade), Pata Negra (tomato, peach, Parmesan, and Ricotta), and Heirloom Carrot (chermoula and carrot tapenade). Each piece was piled high with its topping, making each bite a slightly fun mess as the abundant ingredients threatened to fall over. The grilled vegetables went over well with the group, particularly the creative way to blend Ricotta with olive tapenade. I enjoyed the pata negra for its supple jamón ibérico on top and the bright flavors that came from the peaches and tomatoes. Ultimately, however, my favorite by far of these three was the heirloom carrot because of the intense chermoula accompanying it; the Moroccan seasoning really gave the carrot crostini a vibrant personality that was accentuated by the vegetable's prepared texture which had a bite to it but was still soft. For their starters, Fig & Olive has brought on board two lovely options - their Heirloom Baby Beet & Burrata Salad (burrata, red and gold heirloom roasted baby beet, kumato tomato, orange segments, micro arugula, chives, raspberry balsamic dressing, and basil lemon olive oil emulsion) and Crab Cake (bell pepper, shallot, horseradish, lemon, cilantro, and sweet pimenton aioli). I didn't get a chance to taste the latter but the former did find its way on the other end of my fork. The plate itself for this salad is impressively beautiful. 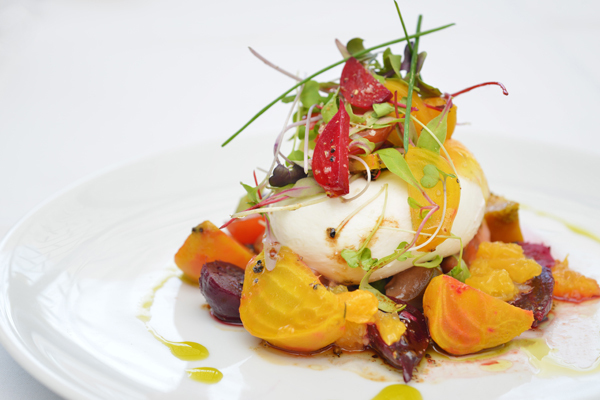 A medley of baby beet chunks forms the base for a generous lump of creamy burrata. It was almost too generous because the starter could have been a meal by itself, albeit a small one. I particularly enjoyed the dainty pieces of micro-herbs atop it all, and though the heaviness of the cheese could have trumped everything, the balsamic and olive oil cut through well enough (along with the orange segments) to balance the dish out. 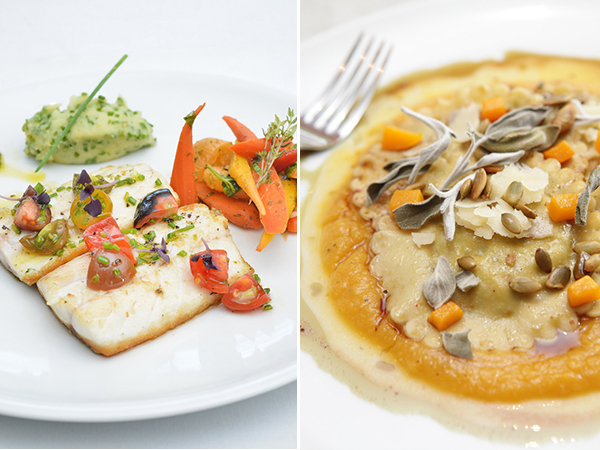 On the fall menu are three different entrees to choose from that hit the main proteins of fish, chicken, and beef: their Branzino A La Plancha (marinated with l'orange spice and accompanied by olive oil chive mashed potato, carrot, chermoula, red micro basil, sauce vierge, and Cobrancosa olive oil), Pumpkin Sage Ravioli (chicken, Ricotta, and chermoula in pumpkin olive oil emulsion with toasted pumpkin seeds, Parmesan, and aged balsamic with Frantoio olive oil), and Cote De Boeuf (for two - 36oz Creekstone Farm bone-in ribeye served with marble heirloom potato in a short ribs jus reduction Arbequina olive oil bearnaise with choice of two sides, served tableside)(pictured above in all its glory). The branzino was cooked perfectly and with the marinade of Chef Lorange's proprietary and namesake seasoning, it really paired well with the revisit of carrot with chermoula. The mashed potato gave a contrasting texture to the slightly crisp skin of the fish as it was smooth and creamy. You could even point out that the fish was quite smooth in its own right though flaky in all the right places. The ravioli first took me by surprise as I had assumed that the pumpkin would be the main stuffing of the pasta but it was actually chicken. This let the pumpkin have more of a show outside of the dough as it was present in all other forms from the oils to the pumpkin seed topping. Too often, pumpkin dishes for the fall trap themselves into just showing off the common spices that come along with pumpkin dishes (cinnamon, nutmeg, clove, etc) but this one truly paid attention to the squash itself. By this time, I was ready to give another cocktail a try and why not go for the one with their name? The Fig & Olive ($14 - cucumber-infused vodka, blood orange olive oil, blood orange purée, celery, egg white, simple syrup, and lime juice) is a relatively new drink to their libations menu and follows along with their fare's theme of using olive oil in almost everything. We saw a lot of olive oil in the actual food items but it doesn't show up often in drinks. This was a refreshing tall glass that seemed quite fitting for a summery day...or a southern Californian fall. 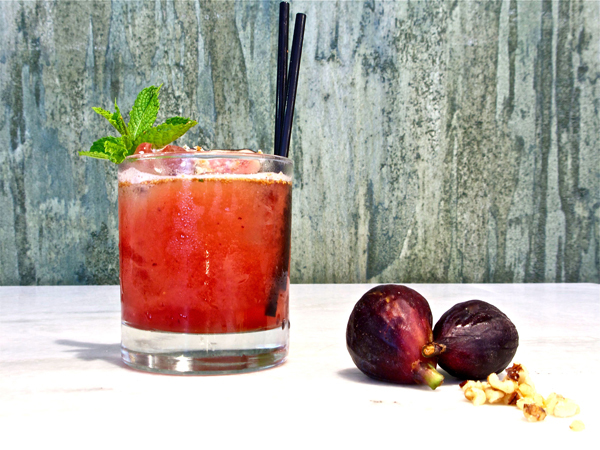 Light with some sweetness from the blood orange, the Fig & Olive cocktail is an easy drink that most palates would enjoy. 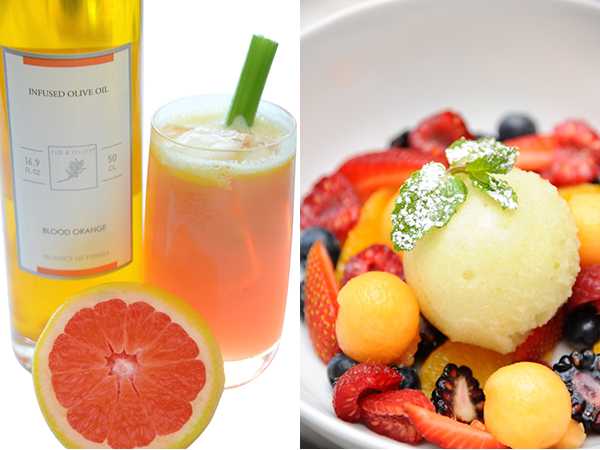 Now though we had had olive oil in savory items, that does not mean that Chef Lorange's creativity stops there. Our luxurious dessert came with that component too - the Green Apple Sorbet (citrus segments, fresh mint, and Picholine olive oil syrup)! Just the thought of green apple is making my mouth water but you'll have to toss that preconceived notion aside when you look to Fig & Olive's interpretation. The normally tart fruit is granted a little more sweetness in the sorbet-making process so that instead of something that will make your mouth pucker, the sorbet just makes you go for more scoops. It is surprisingly crisp and a definite palate cleanser. The flavor is irrefutably green apple but the bite is not there; instead, you are left with a mound of delightful, cold dessert that I stress everyone try. The only fall menu item we failed to try was their Maine Lobster Roll that is only available at lunch. If you want to catch these dishes, visit them at 401 Newport Center Dr., Suite 151 in Newport Beach, and make a reservation if possible! All photography in this post was provided by Fig & Olive.